Quick Connect Computer Services is a full-service technology company providing computer and related systems repair and support in Lincoln, Omaha, and surrounding areas. Whether you need: operating system troubleshooting, virus & spyware removal, upgrades, computers built from scratch, network installation & administration, web design, hardware & software consulting, small office support, or even training – we will be on-site to bring the solution to you at home or your business. You can also stop by one of our conveniently located stores in Lincoln NE or Omaha NE. Quick Connect Computer Services is dedicated to making sure your needs are met at all levels of the repair process with the most friendly, reliable and honest service and support anywhere. We’ve been doing this since 1996 and look forward to bringing our experience to the table with your project large or small. 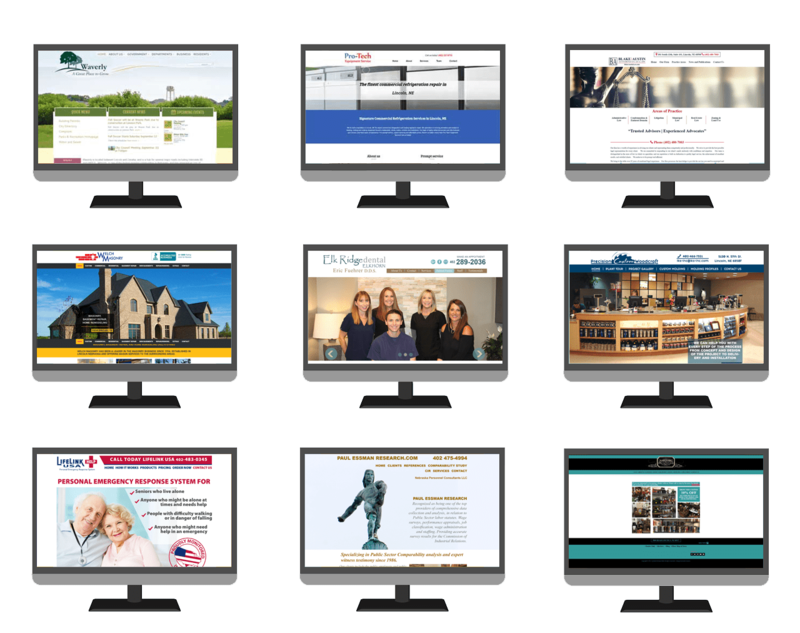 Did you know we also design websites? Quick Connect Computer Services repair department believes you shouldn’t have to worry about your technology… that’s our job. 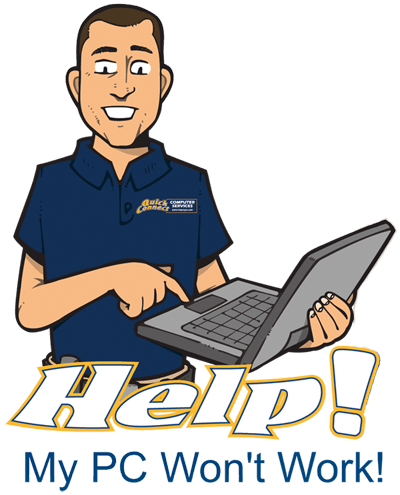 Just give us a call and we will come to you to alleviate your tech woes and maybe show you a few ways to make things even better. Our slogan, HELP! My PC Won’t Work!™ has explained how many of our clients feel before calling us. If you want to be kept updated through the computer repair process, we are always more than happy to explain what we are doing and why, in language you can understand step by step. Our ability to talk directly to customers so they understand what is going on with their computer or network is our calling card! When you have computer problems, our shop is built for you! 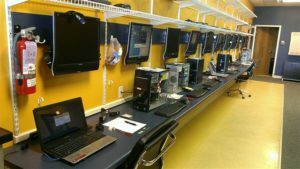 We can work on close to 30 computers in our shops at the same time on full-sized workbenches with a monitor for each station. Customers are impressed when they walk into our stores seeing the size of the work area we have for computers. More bench space allows us to keep more computers moving along the repair process versus sitting in a queue waiting just to get on. We have more bench space than any other shop in town, including the box stores. 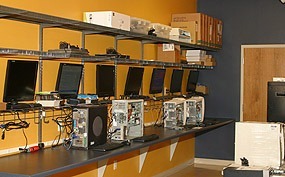 Our computer repair shops are designed to streamline the repair process. 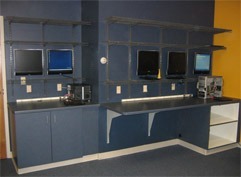 Our workbenches feature flat screens mounted on the wall to save space so we can work on numerous computers at the same time. This keeps turnaround time fast and efficient. Each computer that comes in gets the full service. We do full diagnostics on each computer to find possible underlying issues. Once diagnostics pass and the repair is also complete, we will always include installing all the updates we can find for your computer. OS updates, BIOS updates, Driver updates, program security patches will all be installed for no extra charge under a repair level. This will help keep problems out and your computer secure. We have a large selection of replacement parts on hand at all times to help quickly get your PC back up and running as soon as possible. Our on-hand inventory is stocked with the targeted parts that will allow us to have 95% of what you need when you need it, keeping repair times low. There are not many shops that will keep the extensive inventory that we do in stock and available. If we don’t have a part in stock, we can often get it here very fast with the strong relationship we have built with our vendors over decades being in business. We are also experts at finding parts that are hard to come by for those enthusiasts that insist on keeping an older computer humming along. Some people get attached to their computers, WE GET IT! One of our workbench toolboxes. Your PC will be cleaned and repaired by our in-house or on-site technicians. Each QC technician is trained through extensive hands-on training. We keep our skills fresh by using them daily. We stay organized and always keep a close eye builds and repairs that we have open on our benches. Our goal is to impress you, our client! We currently support Windows 10, Windows 8, Windows 7, XP, Windows Vista, Linux, and Server Operating systems. Have a MAC? We do extensive work on Apples also! Whether it’s a Microsoft or Apple system, the QC team has extensive experience working with both. Have a complicated technical problem? We will figure out the best way to make it work, at home or in the office. Besides computer repair, we provide planning, setup, and support for wired and wireless networks. We also can recommend equipment that will suit your current and future needs and much more! 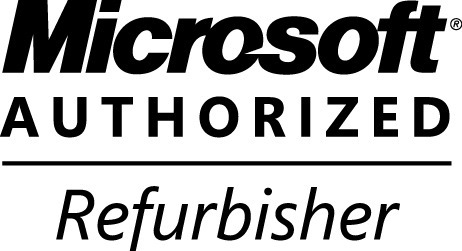 We are a Microsoft Authorized Refurbished Dealer! Our shops are spotlessly clean, contemporary and have an inviting atmosphere. Friendly, knowledgeable, experienced, and prepared technicians on-site and in-store. Flat rate, affordable pricing structure with upfront & very accurate estimates that will reflect your final price. 60 day NO HASSLE follow-up calls after the work is complete and if the problem reoccurs. Convenient hours and Emergency Service if the situation requires. Both local businesses and residential customers benefit from our on-site computer services. We also have a long list of references from small to large companies that have used our services for many years. Qc has an innovative flat-rate pricing structure that protects our customers from hidden charges. Our flat rate pricing also allows us to provide a follow-up call for up to 60 days after a repair job. Local businesses and select residential customers also benefit from our prepaid maintenance agreements. These maintenance agreements provide customers with outstanding priority service and an easy way to pay, saving them money off our normal rates. We are working to gain a customer for life; not just fix a computer. If you are paying per month for your computer support, we can almost always save our clients hundreds if not thousands of dollars a year with our prepaid retainers that do not charge clients per month. Our VIP prepaid clients get VIP service onsite, in office, or even remote. There are a lot of options for computer repair in Lincoln and Omaha. Quick Connect Computer Services has been in business since 1996. Not only have we been in the computer business for over two decades, but we maintain the highest possible rating with the Better Business Bureau, A+. Quick Connect is the tried and tested leader in Lincoln and Omaha computer repair. We love what we do! Above all else, we are committed to excellent service. We really do live up to our slogan, “We Can HELP! You With Your Computer Today." You can set an appointment online today, send us an email, or give us a call. Ashland, Beatrice, Bennet, Bennington, Ceresco, Council Bluffs, Crete, Davey, Denton, Firth, Eagle, Elkhorn, Elmwood, Greenland, Hallam, Hickman, La Vista, Lincoln, Malcolm, Milford, Nebraska City, Omaha, Palmyra, Panama, Papillion, Ralston, Raymond, Roca, Seward, Sprague, York, Waterloo, Waverly. Your city not listed here, just ask!